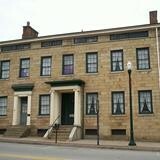 Had a wonderful time yesterday visiting the historic Bradford House in Washington, PA. Finished in 1788, the house is the oldest in Washington, and one of the oldest in western Pennsylvania, and played a major role in the famous Whiskey Rebellion of 1794. 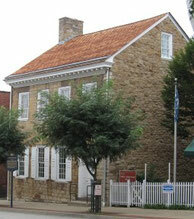 The house has been designated a National Historic Landmark. We had a very nice chat and tour with the lovely ladies there, Denise Cummins and Paula Anderson who made us feel right at home. Both of them are extremely knowledgeable about local history and the Whiskey Rebellion in particular, and are experts about the Bradford House. The house and gardens are jaw dropping beautiful and the period furnishings compliment the home perfectly. Be sure to visit their gift shop. Tell Denise and Paula I said Hi! This year they are celebrating their 50 years as a museum! The road to this point has been long and hard, with many fits and starts along the way. Any support you can give to the Bradford House Historical Association would be very much appreciated by the fine folks there, so give big! It only hurts for a little while. If you're anywhere near Washington PA, do yourself a favor and stop by for a tour. Look for info on their Facebook page or their website, links below. When you're finished at the Bradford House, go around the corner and visit the historic LeMoyne House. Built in 1812 by Dr. John LeMoyne. His son, Dr. Francis Julius LeMoyne, a noted abolitionist later lived there. The home was a stop on the underground railroad. It was declared a National Historic Landmark in 1997. The house now is home to the Washington County Historical Society, Clay Kilgore is the Executive Director and is operated as a museum by them, but is so much more. They also administer the LeMoyne Crematory, The Frontier History Center, and the Norma K. Grimes research Library. Don't forget to visit their gift shop. I toured the house when doing research for Born To Serve, and I can tell you it's well worth your time. It's filled with early American and Civil War artifacts, and the entire interior is amazing. Please visit their website for more information. This place runs on donations, so give big folks, it's easy and, well...almost painless.